Kusanku is actually a Chinese diplomatic title. Kosu Kun was known as a famous Kempo master highly skilled in fighting. In 1756 as a military envoy he was sent to Okinawa. In 1761 he began instructing “Tode” Sakagawa in the martial arts after the death of Takahara, who was Kanga Sakagawa’s first instructor. Kusanku never instructed the kata that is named after him. 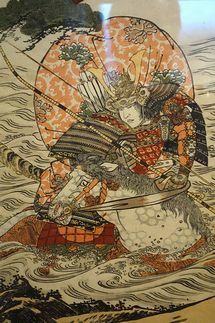 Followers of Kusanku were responsible for the combining of the techniques believed to be the best, into the kata. The two primary lineages for the kata of Kusanku, Chatan Yara no Kusanku and Sakugawa No Kusanku. Master Sakugawa's teaching of this form came from the instruction he recieved from Kusanku. This is the version taught to Soken "Bushi" Matsumura by Sakugawa. This lineage was then further divided into two other forms of the kata Kusanku Sho and Kusanku Dai.